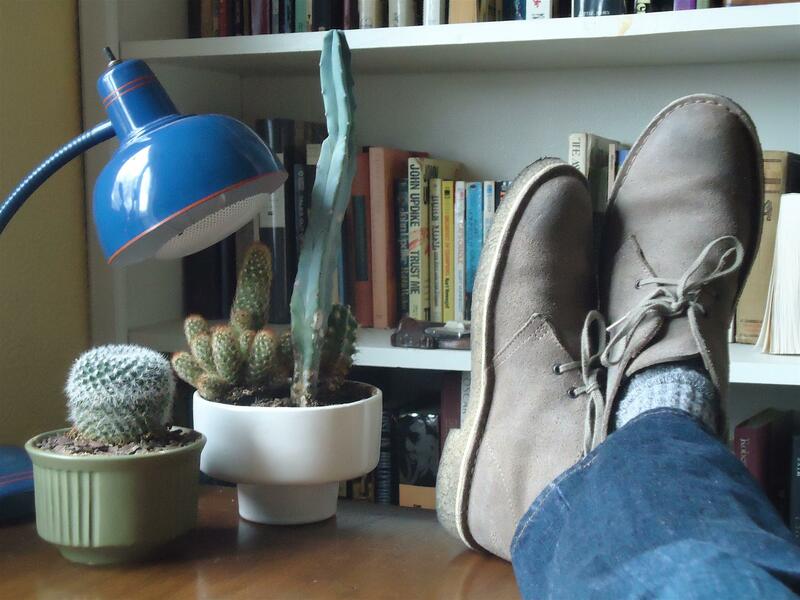 New Clarks Originals arrived this week (top with desk cactii); they may not be a vintage pair, but does it matter? Timeless as they’ve become, desert boots are the epitome of vintage or have transcended vintage, or whichever. Sure, they have their heritage as the British military’s chukka boots and their popularity in subsequent generations of beatniks, mods, and preps, but now they’ve surged in enough eras to belong to no single vintage. Still, I felt sheepish posting about these old friends at all, since they’re surging again, ubiquitous across menswear blogs over the last year. What new do I have to say, in a vintage context or otherwise? I can write more as a bloggee than a blogger with regards to the brotherhood of the chukka, worn down into getting a pair by those very posts after post (my fave from GQ’s Jake Gallagher). I can report that the many advantages they extolled ring true: clean, utilitarian style; quality construction; simple comfort; and lightweight durability, equally of the suede uppers and crepe soles. I thought I might also write as a Northerner and mentally drafted the ‘so-called’ desert boots with virtues every bit as advantageous in snow as sand. But a friend of mine in the shoe business corrected me. In addition to the far less absorbent options available than suede, the chemical properties of the natural crepe soles are especially water repellent and slick on snow despite their wide, crunchy tread. My friend did point out how environmentally friendly the soles were, made from naturally occurring rubber that can be re-used, including all the trimmings. 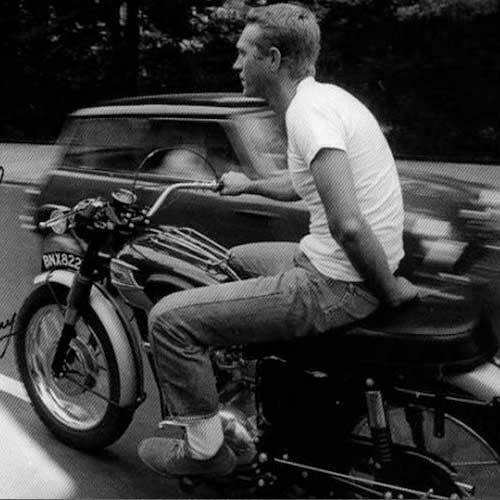 At least if I end up flat on my back in the snow, I can still feel good about it, and look good too (though probably not as good as Steve McQueen). 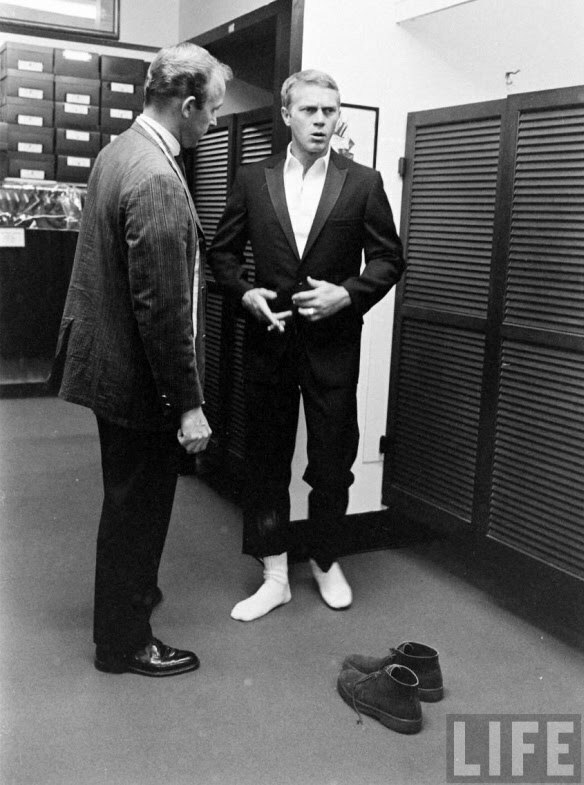 McQueen didn’t wear Clark’s. The boots in the photos are called Playboys and were made by Hutton. Many thanks for the correction!